Citation Information: J Clin Invest. 2017;127(11):4118-4123. https://doi.org/10.1172/JCI89344. Olfactory receptors (ORs) are present in tissues outside the olfactory system; however, the function of these receptors remains relatively unknown. Here, we determined that olfactory receptor 544 (Olfr544) is highly expressed in the liver and adipose tissue of mice and regulates cellular energy metabolism and obesity. Azelaic acid (AzA), an Olfr544 ligand, specifically induced PKA-dependent lipolysis in adipocytes and promoted fatty acid oxidation (FAO) and ketogenesis in liver, thus shifting the fuel preference to fats. After 6 weeks of administration, mice fed a high-fat diet (HFD) exhibited a marked reduction in adiposity. AzA treatment induced expression of PPAR-α and genes required for FAO in the liver and induced the expression of PPAR-γ coactivator 1-α (Ppargc1a) and uncoupling protein-1 (Ucp1) genes in brown adipose tissue (BAT). Moreover, treatment with AzA increased insulin sensitivity and ketone body levels. This led to a reduction in the respiratory quotient and an increase in the FAO rate, as indicated by indirect calorimetry. AzA treatment had similar antiobesogenic effects in HFD-fed ob/ob mice. 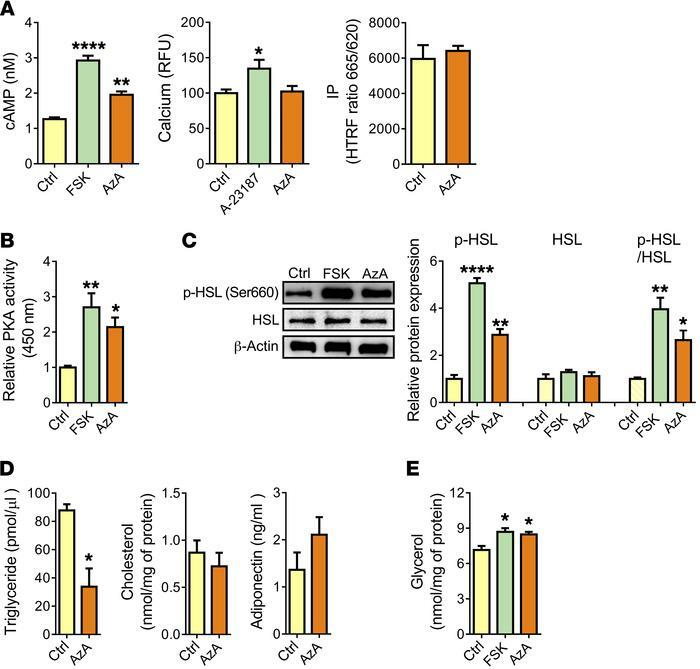 Importantly, AzA-associated metabolic changes were completely abrogated in HFD-fed Olfr544–/– mice. To our knowledge, this is the first report to show that Olfr544 orchestrates the metabolic interplay between the liver and adipose tissue, mobilizing stored fats from adipose tissue and shifting the fuel preference to fats in the liver and BAT. Olfr544 activation by AzA stimulates lipolysis in 3T3-L1 adipocytes. (A) AzA increases cAMP concentrations (n = 4), but not intracellular calcium (n = 8) or inositol phosphate (IP) levels (n = 4). HTRF ratio, homogeneous time-resolved fluorescence ratio (665 nm/620 nm); RFU, relative fluorescence units. (B) PKA activity (n = 4). Relative PKA activity was measured using absorbance at 450 nm and normalized to the protein concentration. (C) Immunoblot analysis of phosphorylated HSL (p-HSL), HSL, and the p-HSL/HSL ratio (n = 3). (D) Intracellular triglyceride (n = 3) and cholesterol (n = 4) concentrations and adiponectin secretion (n = 4). (E) Glycerol release (n = 4). FSK, forskolin (1 μM); AzA (50 μM); A-23187 (10 μM), a calcium-ionophore positive control. Data are presented as the mean ± SEM. *P < 0.05, **P < 0.01, and ****P < 0.0001, by 1-way ANOVA followed by Tukey’s HSD test or Student’s t test for comparison of 2 or more groups.